WASHINGTON, June 14, 2018 /PRNewswire-USNewswire/ -- To create awareness and honor those working to prevent this tragic loss of life, volunteer advocates from American Foundation for Suicide Prevention presented four distinguished attendees with Sandy Martin Grassroots Awards at the annual Allies in Action Awards dinner in Washington, D.C. at the Washington Court Hotel. The honorees were recognized for their leadership in making suicide prevention and mental health the legislative priority it should be. Become a suicide prevention advocate! "Ms. Marine, Dr. Hackman, and Mr. and Mrs. Ojakian demonstrate the true spirit of grassroots advocacy in their work to bring true and lasting change about mental health in their communities. 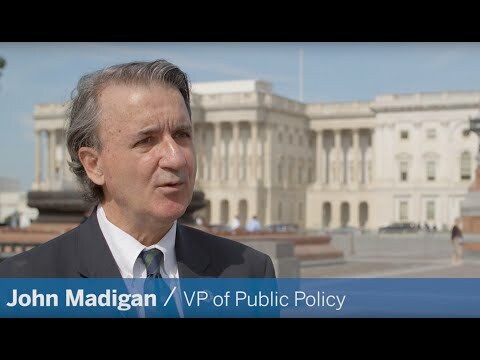 Their commitment to both lobbying for statewide legislation and advocating through personal action have truly made a difference, and made them all allies in AFSP's mission to save lives and bring hope to those affected by suicide," said John Madigan, vice president of public policy for AFSP. As chair of the Advocacy Committee for the Suicide Prevention Coalition of Colorado (SPCC), Ms. Marine has been remarkably effective, helping to pass HB12-1140, which directed the Office of Suicide Prevention (OSP) to work with hospitals to provide information to those treated for suicidal behavior and their families, as well as SB14-088, which created the Suicide Prevention Commission in Colorado. As a founding board member for AFSP's Wyoming chapter, Dr. Hackman worked to ensure mental health parity protections and continued state funding for Wyoming's network of local suicide prevention groups. Dr. Hackman has worked for many years as a psychologist with the Veterans Administration, serving veterans who struggle with PTSD, depression, and risk for suicide. Mary and Vic Ojakian are regular attendees of their chapter's campus and community walks and the California State Capitol Day, have testified on several legislative bills supported by AFSP, and were key contributors to the K-12 Toolkit for Mental Health Promotion and Suicide Prevention. Over 200 advocates from AFSP, from all 50 states and the District of Columbia, were present to acknowledge the work of these life-saving champions. The AFSP advocates were in Washington, D.C. for four days to meet with their members of Congress to encourage them to invest in mental health and suicide prevention. The awards program included other awards given to volunteers who have lost loved ones to suicide or who have their own lived experience with a suicide attempt and advocate for suicide prevention, along with other state elected officials along with other leaders in the field. The American Foundation for Suicide Prevention is dedicated to saving lives and bringing hope to those affected by suicide. AFSP creates a culture that's smart about mental health through education and community programs, develops suicide prevention through research and advocacy, and provides support for those affected by suicide. Led by CEO Robert Gebbia and headquartered in New York, AFSP has local chapters in all 50 states with programs and events nationwide. Learn more about AFSP in its latest Annual Report, and join the conversation on suicide prevention by following AFSP on Facebook, Twitter, Instagram, and YouTube.